The earliest Bard we know by name is Orpheus, who fell in love with the wood-nymph Eurydice . He was a legendary musician, poet, and prophet in ancient Greece. Stories about him are centred on his ability to charm all living things and even stones with his music; his attempt to retrieve Eurydice from the underworld; and his death at the hands of the Maenads. It would have been Heracles’ Bards who propagated the story of his Twelve Labours and subsequent Bards that accompanied the Argonauts on their epic voyage and documented the fall of Troy. Bardism evolved out of the ancient tradition of fireside storytelling. These primitive Bardic seer-shamans were known as Gwyddoniaid . They probably would have dressed in furs and feathers and donned animal head-dresses. There would have been no distinction made between Bards, Druids and Ovates yet. According to legend, Britain was Celticised by a series of invasions, similar to those documented in the Irish book of invasions. The first of these was a group of refugees from the Trojan War sometime after 1000BC . Brutus, the eponymous first King of Britain had, we are told, a Bard called Plenydd, who was known as one of the Primeval Bards and one of the three Warlike Bards of Britain. 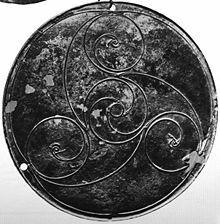 No-one has yet found a specifically Celtic gene; archaeologists and geneticists tend to believe there was an unbroken development from Bronze age through urnfield to Iron age. These people would have been of the urnfield culture, speaking a proto-Celtic language and possibly worshipping a proto-Indo-European pantheon of deities. By the time of Bladud, the legendary founder of Bath, and King Lyr  who were supposedly descended from Brutus, the ancient Britons had probably adopted Halstadt Culture. We are told this dynasty ended in civil war caused by the fighting of Gorboduc‘s sons, Ferrex and Porrex. Order was restored by Dyfnwal Moelmud in the 5th century BC. He was the first British King to wear a golden crown. He codified a system of laws called the Molmutine laws, which organised The Bards into colleges along with the Ovates and Druids. These were the precursors to modern universities’ faculties of arts, science and philosophy. Bards were entitled to five acres of land, maintenance wherever they went, freedom from taxes, no person was to bear a naked weapon in their presence and their word was always paramount. The Bards were heralds of peace . Dyfnwal’s son Brennius defeated the Romans at the battle of the Allia July 18th 390BC . This lot were the first Hill-fort builders and Iron workers who probably would have spoken a Brythonic language and adopted the Classic La Tene culture with its characteristic elaborate knot-work designs. The young Alexander the Great, was impressed with the bravery of the colourful warriors of the Keltoi that he came into contact with, who claimed that the only thing they feared was the sky falling on their heads. Gold and Bronze smithying became a fine art. The Celts were skilful craftspeople and competent farmers, inventing the roller-bearing and their own form of combine harvester. Greek writers Hecateus and Herodotus, mention the Keltoi in their writings and Pytheas of Massilia wrote of the Pretanic Isles in his sailing manual of the 4th Century BC. 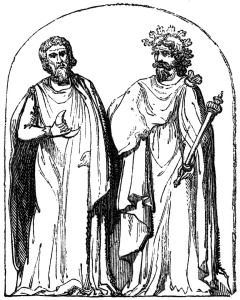 The Celts seem to have been influenced by Classical Greek philosophies and political ideas, such as democracy and Pythagoreanism. Britain was divided into several kingdoms, which acted together as a federation under a High King in times of need. Traditionally succession would have been hereditary through the male line, but a daughter could act as regent in the case of there being no sons. 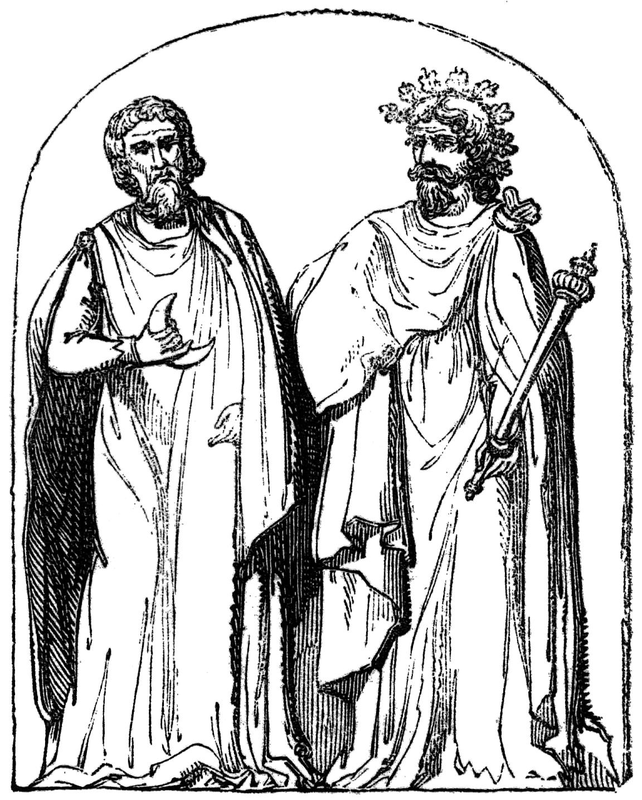 From 200BC the Britons appear to have elected their High Kings, whose reign lasted about five years. Kings could also be Bards: King Blegywryd, who ruled around 160BC is noted for surpassing all other musicians on every kind of instrument. The hereditary line was restored in 119BC with the accession of Manogan the Emperor, who is considered to be one of the three Primitive Bards. He was father to King Beli the Great and grandfather to Cassiwallawn who fought off Caesar’s invasion attempt. This era saw a further immigration of Belgic Celts from mainland Europe, such as the Attrebates from Artois. Caesar mentioned Druids in his chronicle of the Gallic Wars, saying “ [the Druids] preside over sacred things, have charge of public and private sacrifices and explain their religion. … They settle disputes, both public and private. ” He said they had a singular president (the Archdruid), who was voted into a life-long position and stated that the institution of Druidry was thought to have begun in Britain, where people went to learn about it. Teachings were not permitted to be written down, so all was done by memory. Caesar thought they used Greek letters for public and private accounts . Druids were excused military service and taxes and they believed in reincarnation of some kind. “ They dispute concerning the stars and their motion, the magnitude of the world, the nature of things and the force and power of immortal gods. ” Caesar thought they worshipped a pantheon of gods rather like the Roman ones. 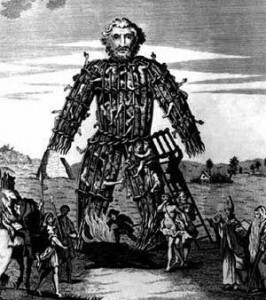 “ The nation of Gaul is much given to religious observances … including public sacrifices ”. Strabo distinguished three classes of Druid, Ovate and Bard. He noted their love of Gold, wearing bracelets, collars and using it for embroidery. Diodorus Siculus explained the roles of Bards, Soothsayers and Druids in more detail. Cicero named his druidical source as Divitiacus of the Aedui tribe. The Romans were keen to emphasise the aspect of human sacrifice and possible cannibalism, as propaganda to justify a future invasion. Certainly it was enough to prompt Caesar’s descendants to ban the religion and then seek to wipe them out. Pliny gave us more information; he told us that the Druids venerated the Oak and the mistletoe, which they gathered on the 6th day of the moon. He believed that they derived their name from the Greek for Oak. He told us about various herbs (as he was most interested in medicine) and also of the fabled Druid Egg, which he tells us was made by the twisting and rolling together of a great number of snakes. He claims to have seen one of these eggs and that the Druids wore it as a distinguishing badge. The first stories in the Mabinogion are set around the turn of the Era. “Lludd and Llevelys”, “Branwen, daughter of Llyr”and “Math ap Mathonwy” are all set in the time before the Romans arrived as is the Irish Ulster Cycle. Cynfelyn, Shakespeare’s Cymbeline succeeded Casiwallawn and ruled from Camulodunum (Colchester) during Jesus lifetime. Caesar conquered no territory and left behind no troops, but had established clients on the island and had brought Britain into Rome’s sphere of political influence. By the 40s AD, the political situation within Britain was apparently in ferment. TheCatuvellauni had displaced the Trinovantes as the most powerful kingdom in south-eastern Britain, taking over the former Trinovantian capital of Camulodunum (Colchester), and were pressing their neighbours the Atrebates, ruled by the descendants of Julius Caesar’s former ally Commius. Caradawc  fought an effective military campaign against Claudius‘s invasion until betrayed by Queen Cartimanduaof the Brigantes. The Romans quickly gained control of southern England from the Humber to the Severn Estuary, roughly along the line of the Fosse way. Boudicca, leader of the Iceni was defeated in 61AD, closely followed by the Brigantes themselves. The Druids were pushed back to Ynys Môn (Anglesey) and wiped out in the Menai Massacre of 74AD. Tacitus gives us an account of the invasion of Mona. The Silures, who provided some of the fiercest resistance, were finally conquered in 76AD. Joseph of Arimathea is said to have founded the first proto-Christian church at Glastonbury in 66AD and was granted jurisdiction over the twelve hides of Glastonbury by King Arviragus. Tertullian (160 – 225AD), an early Christian author from Carthage, certainly believed that the Gospel had reached Britain by his lifetime. He believed that the Druids had pre-disposed the British to receive the Christian faith, by acknowledging one God. 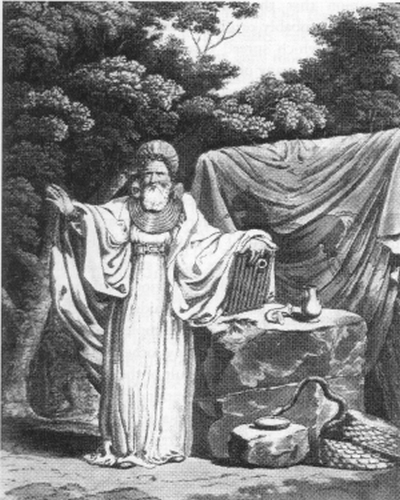 Hippolytus believed that the Druids had been taught Pythagoreanism by Xamolxis, a former slave of Pythagoras. Druidism was suppressed by the Roman government under the 1st-century emperors Tiberius and Claudius, and it disappeared from Roman records by the 2nd century. Virgil composed the Aeneid to create a pseudo-history for the Romans connecting them with the Trojan princes and therefore painting them as the heirs of ancient Greece. The Fenian Cycle is set in 3rd century Ireland, where Celtic culture survived free from Roman influence. The Bards survived the genocide of the Druids by the Romans, continuing the tradition in the courts of the Northern British and Welsh Kings such as Old King Cole who was famed in nursery rhyme for his love of music. Britain became gradually Christianised during Roman Rule. In Ireland, King Cormac encouraged the art of writing and the practice was further developed under St. Patrick. The later stories of the Mabinogion, beginning with “The Dream of Macsen” take place as the Romans withdrew their legions from these isles and Bardic privileges were restored. Once the Romans had left, a struggle for the Kingship ensued between the House of Gweissei and the House of Brittany, which ended with Arthur‘s enthronement. “Culhwch and Olwen”, “The Knight of the Fountain”,“Peredur”, “Gereint” and “The Dream of Rhonabwy” are all set in Dark Age Britain. Idris Gawr is mentioned as being the last of the three Primitive Bards of Britain, who re-invented the harp. 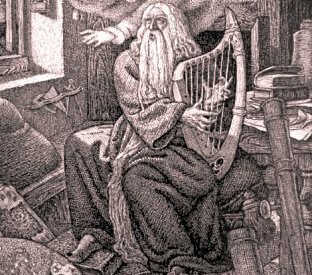 Arthur was a Bard himself, renowned for his harp playing, he and Glewlwyd Mighty-Grasp were both called Imperial performers on the Harp in the Triads. Although the historical truth of Arthur is shrouded in mystery, the story of his quest for the Grail is one of the defining legends of the British nation. 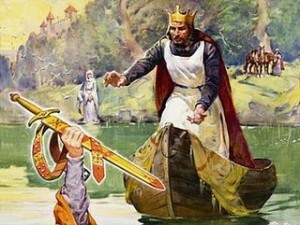 Arthur would have been a Roman Briton, in these stories he is referred to as ‘Emperor’ rather than ‘King’. No mention is made of a Grail, round table or Camelot and Arthur’s retinue contains few familiar names – Cei and Bedwyr are his two staunchest followers and Lancelot is nowhere to be seen. Gildas, a 6th Century British cleric provides us with the only contemporary commentary on this period. He mentions Ambrosius Aurelianus and the Battle of Mons Badonicus, but not Arthur. He condemns five British kings, Constantine, Aurelius Conanus, Vortiporius, Cuneglas, and Maelgwn and gives the clergy a thorough dusting down in his Jeremiad “De Excidio et Conquestu Britanniae”. Next comes Urien of Rheged‘s infamous Bard, Taliesin – one of the three bloody-spear’d Bards of the Island of Britain. 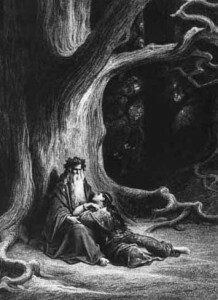 According to the Hanes Taliesin (The Story of Taliesin), an additional tale in Lady Charlotte Guest‘s translation of the Mabinogion, Taliesin was a reincarnation of Gwion Bach, a servant of the goddess Ceridwen. Gwion Bach had accidentally tasted three drops from the cauldron of Inspiration, which was meant for Ceridwen’s son. Fearing punishment from Ceridwen, he fled transforming himself into various animal forms. But when Gwion Bach transformed himself into a grain, Ceridwen turned herself into a hen and swallowed Gwion Bach. Ceridwen became pregnant and gave birth to Taliesin. Instead of killing the baby, Ceridwen threw the infant into the sea, which was rescued by prince Elffin, who became Taliesin’s foster father. At thirteen, Taliesin won renown as par excellence Bard, when he rescued his foster-parents from Maelgwn Gwynedd, king of Wales, challenging Maelgwn’s court Bards, with his skills in poetry, wisdom and foreknowledge. 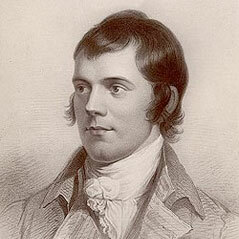 “The Gododdin” was composed at this time by Aneurin the Satirist. Y Gododdin is a medieval Welsh poem consisting of a series of elegies to the men of the Brythonic kingdom of Gododdin (known as the Votadini by the Romans) and its allies who died fighting the Angles of Deira and Bernicia at a place named Catraeth around 600AD. Saxons eventually pushed the Celts West into Wales and Cornwall and south into Brittany, founding the Kingdom of England out of the occupied territory. Somewhere around the 7th or 8th century Tysilio ap Brochwel, Prince of Powys is said to have written an ecclesiastical history, now lost, known as the Brut Tysilio, which may have been one of the first attempts to collate the fragments of British history into a coherent whole. Rabanus Maurus (766 – 856AD) stated that Joseph of Arimathea was sent to Britain. In the ninth century, the rules for the conduct of Bards were revised and updated by King Hywel Dda along with all the other laws and ancient records of the Britons. In this the Druidic College is described as having a triple structure of Scholars, Smiths (Gofaint) and Bards. Nennius produced the first surviving record of the genealogy of the British Kings in Latin. 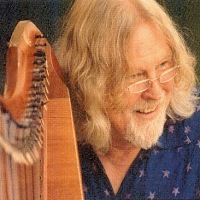 Prince Gryffydd ap Cynan, whose Bard Crella was one of the three Bards of the Harp, created further Bardic laws, which divided the colleges into the schools of the mediaeval Bards: Poetry, Heraldry (storytelling) and Music. In the twelfth century, Geoffrey of Monmouth (Gruffudd ap Arthur) produced his chronicle “Historia Regum Britanniae”, which included one of the earliest developed narratives of King Arthur. Geoffrey claims that he was given a copy of an “ancient book in the British language that told in orderly fashion the deeds of all the kings of Britain”, given to him by Walter, Archdeacon of Oxford. This may have been the Brut Tysilio or the Brut Brenhinoedd, or possibly a cover story for his own literary invention. He certainly drew on Gildas, Nennius and Bede and possibly Roman authors such as Orosius, Livy and Virgil. Thomas of Britain and Béroul wrote down different versions of “Tristan”. William of Malmesbury in his“Chronicle of the English Kings”, written around 1120AD, he connects Philip the Apostle’s mission with Glastonbury. Robert de Boron was the first to put all those pieces together and include the Grail; he wrote the Grail story “Joseph d’Arimathe” and “Merlin” around the same time as the monks at Glastonbury claimed to have discovered the coffins of King Arthur and Guinevere. 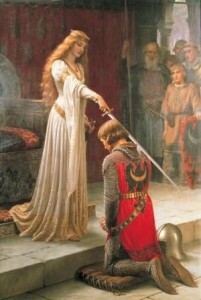 Wace and Layamon used Geoffrey of Monmouth as the basis of their own Bruts and Chrétien de Troyes turned Arthur into the chivalric character we know in the mediaeval romances, with the Grail, the sword in the stone, the Lady of the Lake, the Round Table and Launcelot being woven in with themes of courtly love. The stories of the Mabinogion were written down for the first time and “Taliesin” was probably composed in mediaeval times. The Irish Book of Invasions, the Book of the Dun Cow and and the Book of Leinster all date from the early 12th century AD. Notable Bardic works are the poems of Amergin and Aneurin; the Black Book of Carmarthen; the White Book of Rhydderch and the Red Book of Hergest; the Book of Taliesin; Dafydd ap Gwilym, a 14th century Welsh poet, generally regarded as the greatest Welsh poet of all time; Iolo Goch; and the Triads. Irish scribes created The Yellow Book of Lecan, The Great Book of Lecan, The Book of Hy Many, and The Book of Ballymote in the 14th and 15th centuries. 500 Welsh Bards were sent to the stake by Edward I of England for failing to sing his praises at a banquet in Montgomery Castle in 1277. Llywelyn ap Gryffydd was slain in 1282 and with him fell the ancient independence of the Cymru who became subject to the King of England. This deprived the Bards of their courtly income and over the next centuries reverted to their itinerant mode. and Plenydd, Bard to King Brutus. The Bardic tradition continued through the institution of the Welsh Eisteddfodau up to the present day. The first recorded Eisteddfod was held by Lord Rhys of Cardigan in 1176 and the first large scale event was in 1451 at Carmarthen. A silver chair was contended by professional poets patronised by the nobility. The best crwth player was awarded a silver crwth , the best harpist a silver harp and the the best singer a silver tongue. The printing of Mallory‘s “Morte d’Arthur” at the end of the 15th Century revived interest in the Matter of Britain in Tudor times. The Tudor house being derived from Celtic stock. Shakespeare wrote “King Lear” and “Cymbeline”. Elizabeth I commanded that all Bards be examined and licensed. By the 17th century, the ancient Bardic lineages had all but died out, except for remote parts of Scotland and Ireland. The revival of modern interest began with John Aubrey, who was instructed to make a survey of Avebury and Stonehenge byCharles II. It was he that first associated Druids with Stonehenge. (Bearing in mind Inigo Jones thought they were Roman ruins, this was a great step forward). William Stukeley was the first modern person to identify himself with being a Druid – he was also into Platonic and Pythagorean ideas and referred to himself as a Deist. He later became an Anglican priest and sought to reconcile Druidic, Christian, Egyptian and Jewish beliefs. In 1740 John Wood surveyed Stonehenge and Stanton Drew, building the Bath Circus on a plan based on Stonehenge specifically as a Druid Temple. It is still used by Gorsedd Caer Baddon for that purpose. 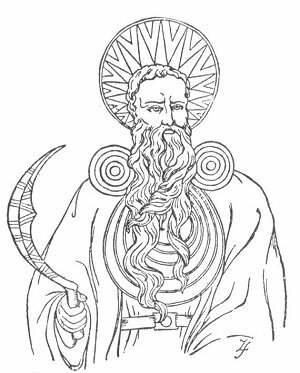 It was also he who who made the unlikely connection of the Hyperborean Abaris as being Bladud’s chief Druid. The 18th century saw the rise of various clubs and associations, which had grown out of religious fraternities and trades guilds. In 1751 the Honorable society of Commodorion was founded, a Welsh ex-pat gentlemen’s club. 1770 saw an offshoot – Gwyneddigion, which was a more working class version of the society. The Ancient Order of Druids was formed in 1781 – a gentlemen’s club based on a love of music and literature, which forbade the discussion of religion or politics. It rapidly expanded to several lodges stretching from East Anglia to Kent to Bristol with six Lodges in London. The Eisteddfod at Corwen in 1789, was the first to admit the general public and prizes were provided by the newly formed, London-based Gwyneddigion society. 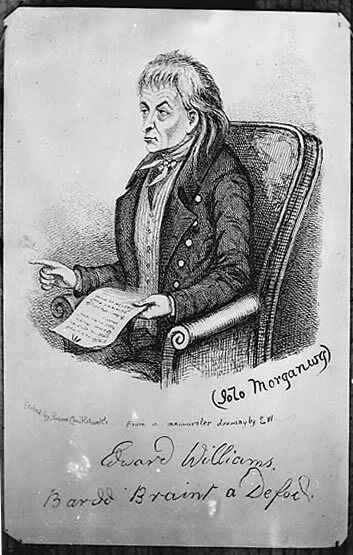 In 1792, Edward Williams (Iolo Morgannwg) held a revived Gorsedd on Primrose Hill under a system of rules and ceremonies largely devised by himself. In 1819 it was formally incorporated into the Welsh Eisteddfods, at a meeting at Ivy Bush Inn, Carmarthen. Morganwg contributed some forged material to Owen Jones‘ “Myvyrian Archaiology”, which was an attempt to collect the entire repository of ancient Welsh literature into three volumes. Morganwg’s notes were posthumously published as “Barddas”; he claims to have worked from a manuscript published in 1560 by Llewlyn Sion, which is now conveniently lost. In 1809 Edward Davies published his “Mythology and Rites of the British Druids”, which refuted much of Morganwg’s material and presented his own theories of antediluvian myth instead. In 1833 many of the provincial lodges of the AOD seceded to become the United Ancient Order of Druids over issues of accountability and membership payments. This order had a proper board of directors and provided a kind of life insurance for its members and provided other charitable functions. Tennyson based his retelling of the legends in “The Idylls of the King” primarily on Sir Thomas Malory‘s “Le Morte d’Arthur” and “The Mabinogion”. 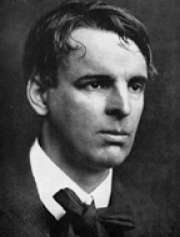 W. B. Yeats published his collection “The Wanderings of Oisin and Other Poems” in 1889. “The Golden Bough” by Scottish anthropologist Sir James George Frazer was published in 1890; its thesis being that old religions were fertility cults that revolved around the worship of, and periodic sacrifice of, a sacred king. 1858 was the first National Eisteddfod of Wales, including the Gorsedd of the Bards of the Isle of Britain. On 21st September 1928, Pedrog, Archdruid of Britain, assisted by some members of the Welsh Gorsedd, inaugurated the first Gorsedh of Cornwall. Henry Jenner was installed as Grand Bard and twelve new Bards were added to the existing eight, who had been raised in August of the same year. “The White Goddess” by Robert Graves, was first published in 1948 and expanded upon Frazer’s ideas. T. H. White‘s “Once and Future King” was published in 1958 and in 1961 “Asterix the Gaul” was published by Goscinny and Uderzo. The writings of C. S. Lewis and Tolkien also added to the growing popular fascination for fantasy and magic. 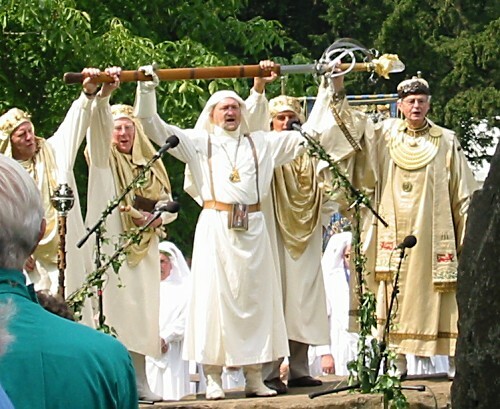 In 1964, Ross Nichols formed a new Druid Group – The Order of Bards, Ovates and Druids – which has become one of the most well-known orders after the Ancient Order of Druids. The Grove of the Badger was formed in 1979 in Hastings, England from the core of an Alexandrian Wiccan coven Philip Shallcrass had been initiated into the previous year. This was to become the Mother Grove of the British Druid Order. The current movement to reinstate the Bardic Chairs of Albion began in the 1990′s largely promoted by the late Archdruid of Bath, Tim Sebastion of the Secular Order of Druids (SOD). During a multi-faith conference in 1993 organised by Tim, the Gorsedd of Bards of Caer Abiri was founded at Avebury, based on ritual composed by Philip Shallcrass. 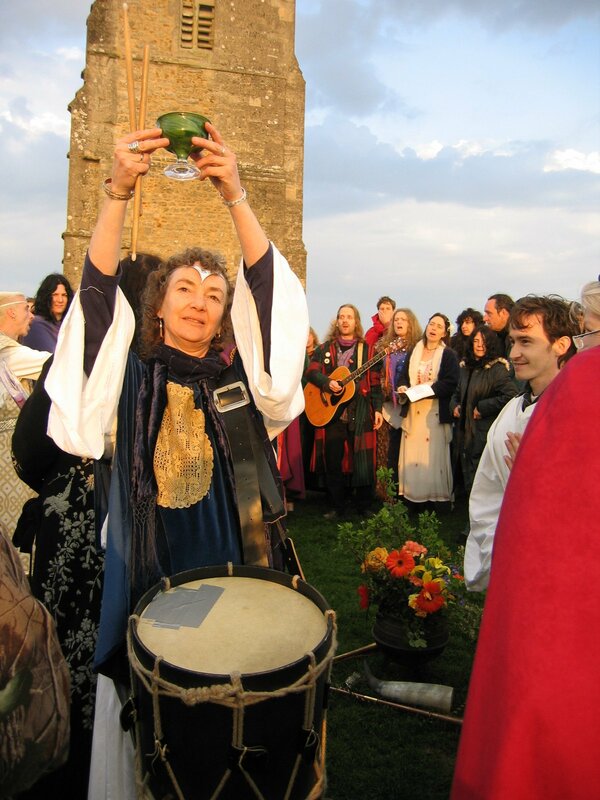 The Gorsedd of Bards of Cor Gawr was founded at Stonehenge in 1997 as part of the BDO‘s work to extend ritual access to the site. Tim set up the Bardic Chair of Bath (Gorsedh Caer Baddon) and assisted with the setting up of the independent Bardic Chairs of Exeter (Gorsedh Caer Wyse) and Glastonbury (Gorsedh Ynys Witrin). 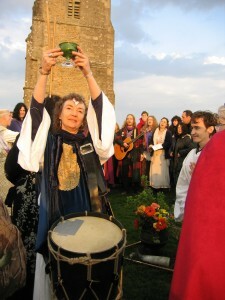 Gorsedh Ynys Witrin was inaugurated on St Hervé’s day 2005 by Glastonbury Archdruids Dreow Bennett and Denise Michell. Installing Tim Hall as the first chaired Bard of Ynys Witrin. Following the death of Tim Sebastion in 2007, Gorsedh Ynys Witrin cut ties with CoBDO and the semi-defunct Glastonbury Order of Druids in order to focus on serving the local Glastonbury community by maintaining the institution of the Bardic Chair and to set up a Bardic College for those wishing to study Bardism as a path of personal and creative development. There were thirty-one towns believed to have been Druidic centres in ancient times (and therefore also Bardic centres) – each seat was a cyfiaith or capital of a tribe. The seats of the three Arch-Druids of Britain were located at Caer Troia (London), Caer Evroc (York) and Caer Leon (Caerleon). Other Druidical seats were Caer Caint (Canterbury), Caer Wyn (Winchester), Caer Municip (St Albans), Caer Sallwg(Old Sarum), Caer Leil (Carlisle), Caer Odor (Bristol), Caer Llear (Leicester), Caer Urnach (Wroxeter), Caer Lleyn (Lincoln), Caer Glou(Gloucester), Caer Meini (Manchester), Caer Coel (Colchester), Caer Gorangon (Worcester), Caer Leon ar Dwy (Chester), Caer Peris(Porchester), Caer Don (Doncaster), Caer Guorie (Warwick), Caer Cei (Chichester), Caer Ceri (Cirencester), Caer Dur (Dorchester), Caer Merddyn(Carmarthen), Caer Seiont (Carnarvon), Caer Wyse (Exeter), Caer Segont (Silchester) and Caer Baddon (Bath). Additionally there were three Druidic Universities at Caer Membre / Caer Bosca (Oxford), Ynys Witrin (Glastonbury) and possibly Cambridge too. Modern Bardic Chairs have been established at: Bath, Bristol, Winchester, Avebury, London, Ely, Exeter and Glastonbury. New Chairs are being set up in Northampton, Leicester and Flag Fen in East Anglia. Even the Small World travelling stage has its own Chair. That brings us right up to date with the history of Bardism. 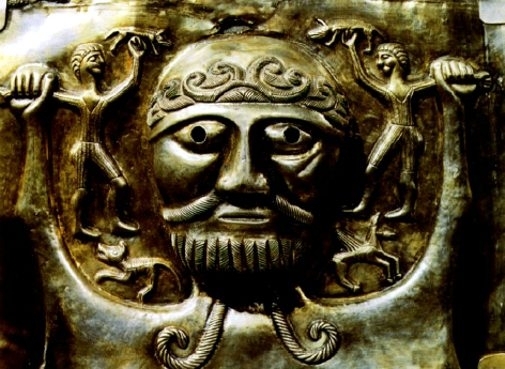 From the Iron-age poet-mystics to Mediaeval tellers of Arthurian tales through to modern antiquarian researchers and neo-pagan reconstructors it is the story of Celtic culture, spanning three millennia, which still has magic and meaning for modern generations. 1.^ This legend was composed by Virgil in the 2nd century AD. 2.^ Gwyddon usually translated as ‘wizard’ or ‘cunning person’ has etymological links with words for science, the alphabet, knowledge, trees and the Irish. 3.^ According to the Welsh Monk Nennius‘s “Historia Brittonum” c.830AD – This story was almost certainly made up by someone or a succession of authors with Roman educations sometime bewteen the Roman occupation and the 12th century. 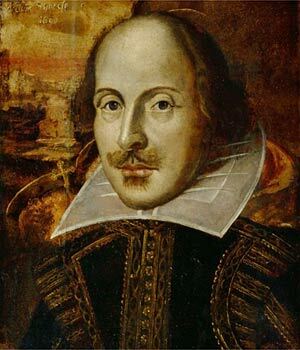 4.^ The King Lear of Shakespeare’s play. 5.^ Much of this ‘information’ seems to have been reverse-engineered from the laws of Hywel Dda by Iolo Morgannwg. 6.^ According to Geoffrey of Monmouth. 7.^ There is no real evidence of the ancient Britons using Greek letters, although the Iberians had developed a script, which looked a bit like Greek. 8.^ King Caractacus of the Rolf Harris song and son of the late king of the Catuvellauni, Cynfelyn. 9.^ A crwth was a bowed lyre, a kind of precursor to the violin.